Check for supernatural spirits in your vicinity. Is there a better alternative to EMF6742? Is EMF6742 really the best app in Simulation category? Will EMF6742 work good on macOS 10.13.4? EMF6742 allows you to scan for anomalies in electromagnetic fields (EMF) by using your computer's wireless capabilities. 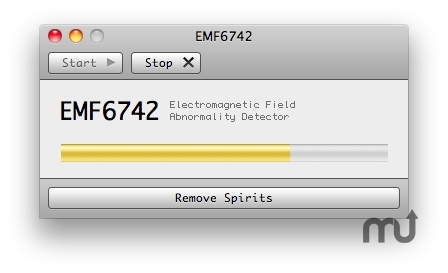 Anomalies in EMF can be attributed to spirits in close proximity. The higher the number shown, the more anomalous the EMF. EMF6742 needs a rating. Be the first to rate this app and get the discussion started!